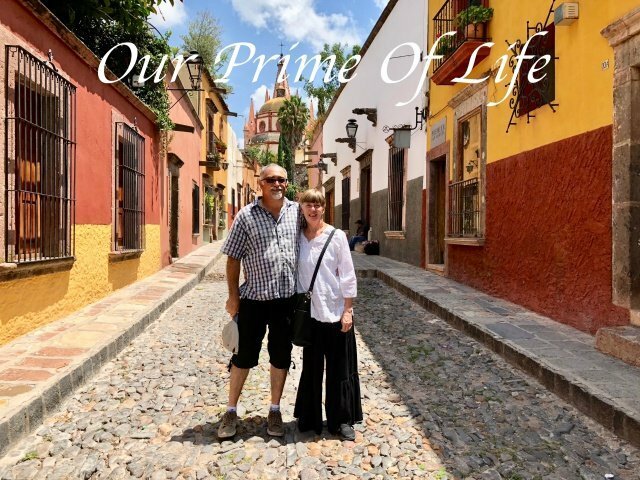 We are Glenn and Ria Talken and we’re coming into what we consider Our Prime Of Life, it is not about age, to us it is about lifestyle choices. We have known each other and been great friends for 25 years, have been together since 2013 and just got married May 12, 2017. Having spent a good portion of our adult years traveling around the world and working in the travel industry it is time to take the big leap and head off on new adventures in our retirement years. We will sell the house, get rid of everything we own and plan a course with 6 suitcases in tow. Our first home base will be in San Miguel de Allende, Mexico. It is a town Glenn has lived in for a year and I visited him there many years ago, and since then we have have been back to relax in it’s charms. We last visited in 2015 and still loved it’s atmosphere. Being close to the USA it is a logical place to start. We will pursue temporary resident visas and rent a house. I will try to learn Spanish and Glenn will increase his knowledge of the language. We will try to get back in shape while still eating our way through markets and restaurants. We know that is a big goal, but hopefully classes in yoga and Glenn’s daily tai chi practice will help. We want to immerse ourselves in a new country and culture and have meaningful fun along the way. We know there will be too many more challenges than we even think of now, but believe we are up to it. Living in the USA right now is not an option. We need to get away from the work till you drop while buying all you can mentality. We want a calmer, less hectic, less commercialized, less stressed way of life. We are tired of the divisive politics and mean spirit that seems prevalent. We know our future won’t be all flowers and sunshine and we will inevitably get frustrated and even down when we first start out. But we have always been adventurous, so we will have ourselves a go. We know we will miss family and friends but hope to have a room or two for visitors, and we are eager to see what new meaningful friendships can arise. As we get older we enjoy slowing down and taking more time to get the feeling of the place we are in, rather than rushing from one place to another. We are no longer budget backpackers and we want a bit of cleanliness, comfort and ease now. We don’t have a huge budget so we will be looking for the best way to stretch our money and time on future endeavors. This will be our chronicle and we hope you follow along and enjoy the ride wherever it takes us.